I am such a creature of habit. I always say I’m going to try some place new for lunch but then I end up right back at SATCO for the same soft taco, chips and queso. But today, after a mere 8 years working downtown, I made my way down to the much talked about Arcade. My lunch buddy and I ventured out. 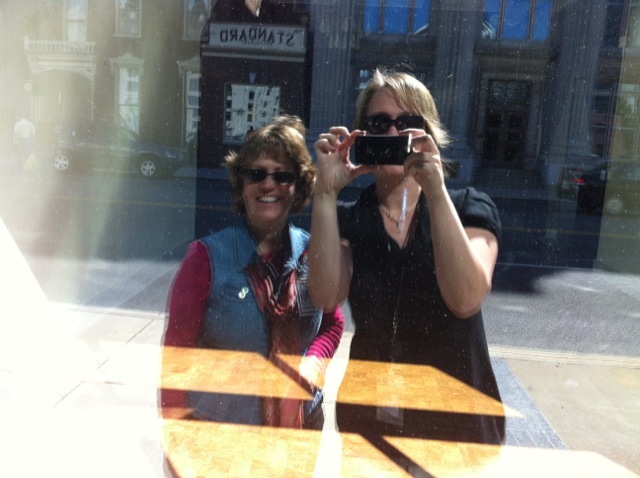 I have never been great at the taking your own picture thing so, instead, I asked my dear friend to please look in the window of this empty building and smile. She’s a good sport. 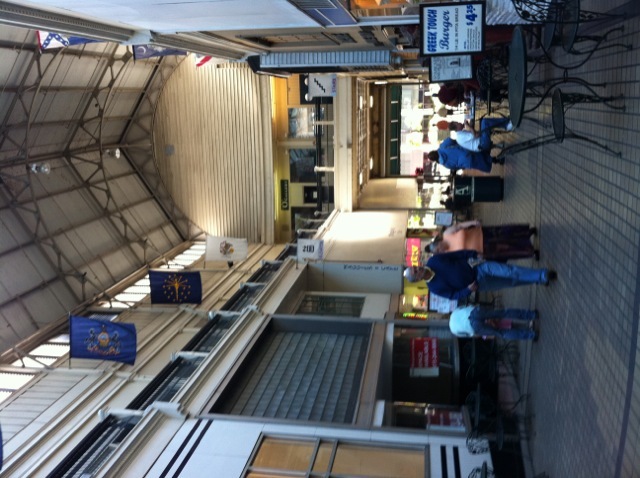 Here is the arcade: restaurants, hair salons, shoe repair, a post office…a hodge podge of businesses and people. But we knew why we were there. 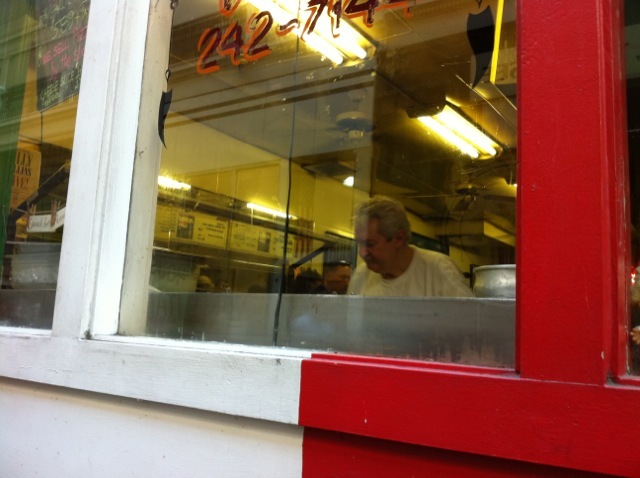 There he is now…Joe. Or Jim. Okay, I have no idea what his name might be. But, around these parts, he’s the Pizza Nazi. I’m sorry but, if you don’t watch Seinfeld, I don’t have time to explain it. Just remember to have your order ready before you step up to the counter. Or, if you’re like me and crumble easily under pressure, you will just order whatever is first on the menu. Luckily, it was pepperoni and I happen to like pepperoni. 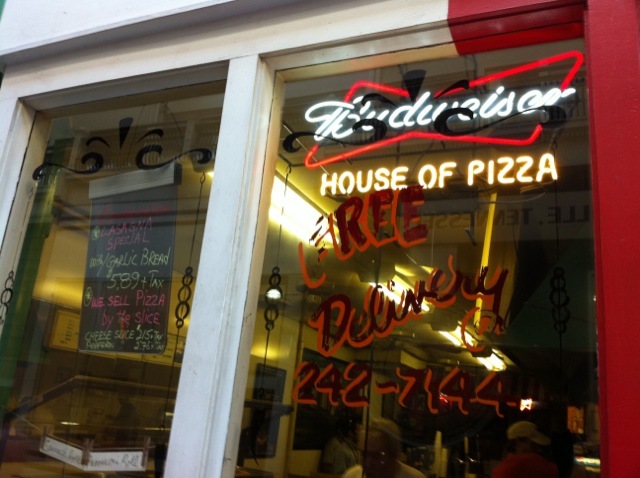 He runs this little place aptly named…House of Pizza. 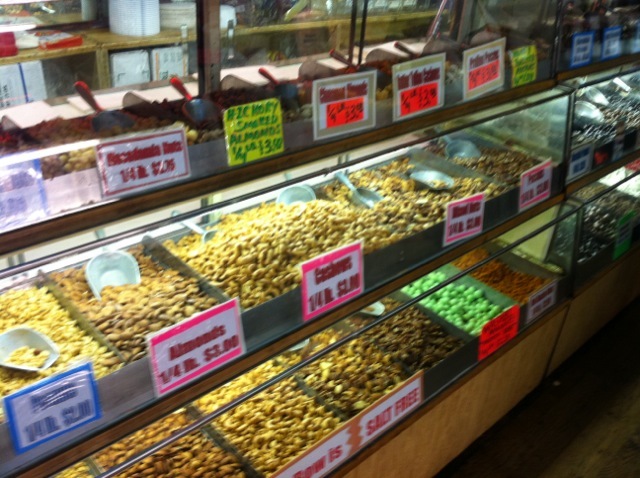 Then, because we were just feeling extra adventurous, we went to The Peanut Shop where they have lots and lots of…nuts. They also have ice cream. And, really, what is better to follow pizza than ice cream? 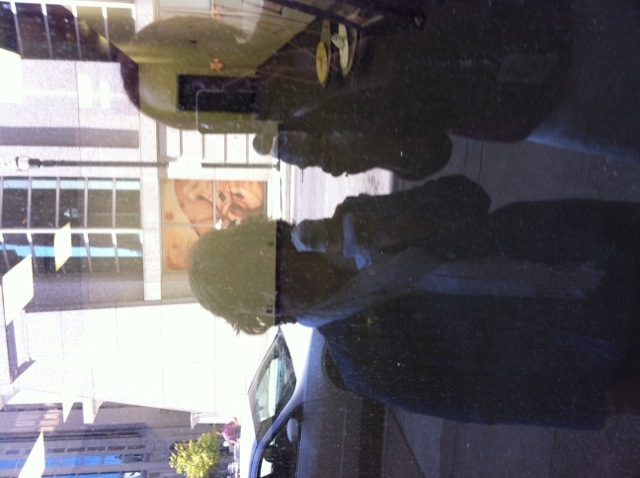 Oh, there is another empty building…let’s look in the window and smile. Wow, someone needs to clean that window. How is a girl supposed to get a good picture with all of that dirt? And, yes, we’re wearing different clothes than we are in the first picture. You caught me. That first picture was from another day. Whateva. The important thing here is the ice cream. Ooops. It’s all gone and so is my lunch break. Back to work. ← Warning: There is no point ahead. You two are just weird sometimes! I let Sharon go to work, and look what happens! But seriously — I hope you two had fun! I’m glad you both went out. It sounds great. 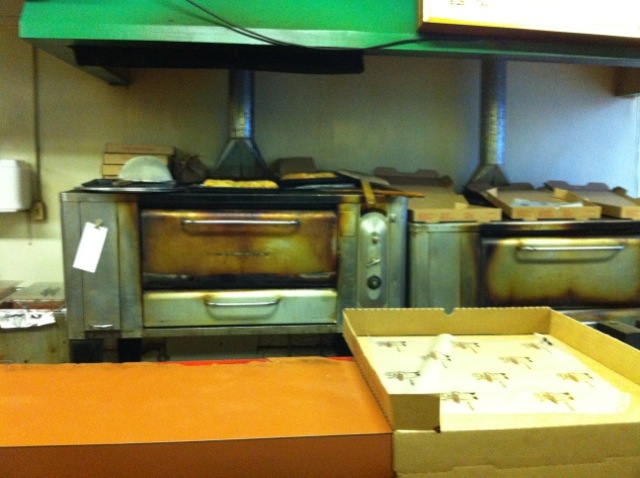 Now I want pizza from the “Pizza Nazi”!! This post totally made me hungry! I haven’t had supper yet! It’s a good thing to step out of your routine and try new places. Glad you enjoyed it! Hope you’ll stop by my blog when you get a moment. Love it! I am one of those that gets caught in routine and doesn’t stray far! What treasures can be found when we do! Have a great weekend! Ha! 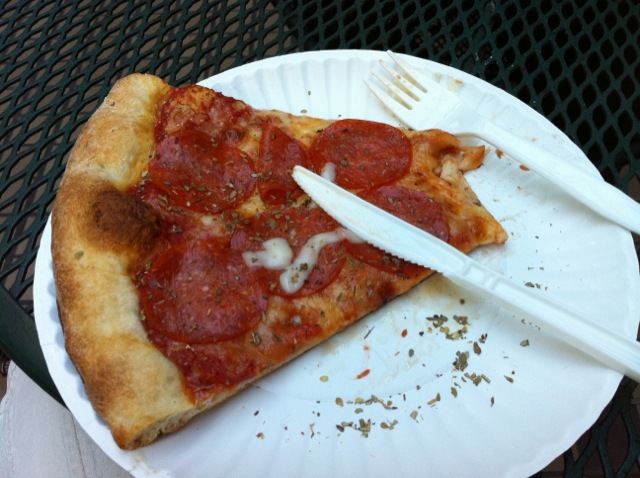 Pizza Nazi….love that Seinfeld episode. I hate that kind of pressure – I feel it at Starbucks all the time. 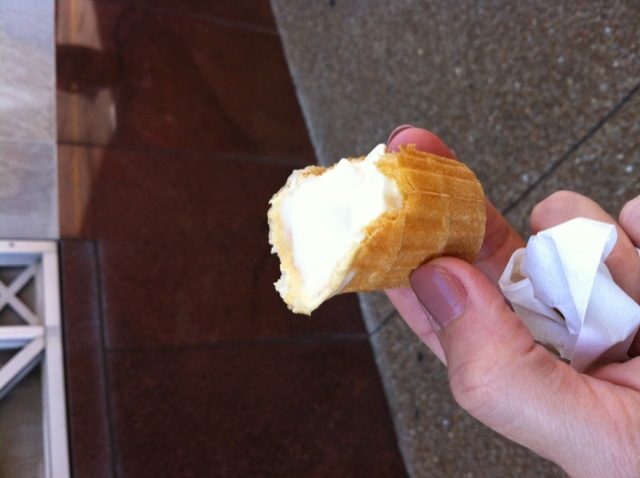 Your lunch adventure was fun to read – ice cream cones are the perfect way to end it. Thanks for linking up for CG Coffee!! Loved the visit. Hubby always asks what I want and I just say ‘Surprise me.’ I’m adventurous that way, but I do order the same thing once I find something that I like. The pizza looks delicious. That looks like so much fun! Haha, the Pizza Nazi 🙂 That pizza looks really good. I am most intrigued by the shop of nuts! 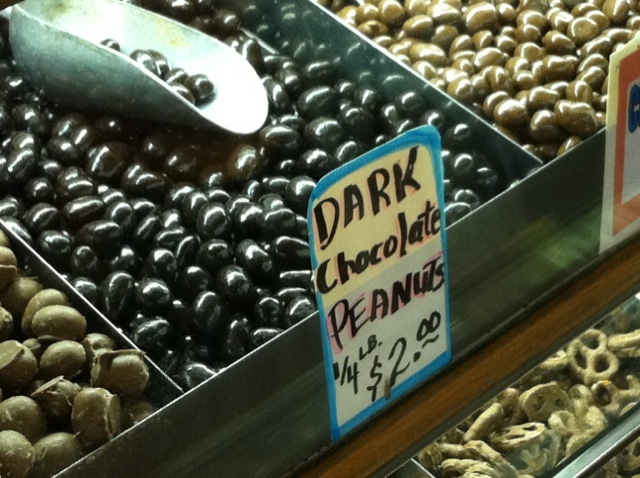 Dark chocolate peanuts? Yes, please!